Health officials have identified a cooling tower at the Opera House Hotel as the source of the Legionnaires' spike that has sickened more than 120 people in the Bronx, killing 12 of them, since July, marking the largest outbreak of the disease in New York City history. 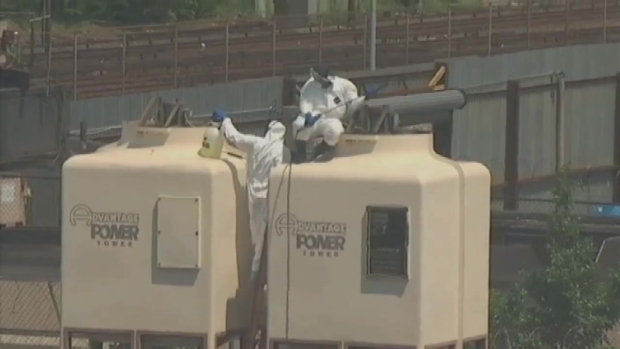 The tower at the Opera House Hotel was disinfected Aug. 1, authorities said. The last case reported in connection with the outbreak was reported two days later. Local, state and federal officials tested samples from 25 patients linked to the outbreak, including some who died, and in each case found a match to the strain of Legionella found in the cooling tower at the Opera House Hotel. Health Commissioner Mary Bassett made the announcement at an afternoon news briefing Thursday as she declared the outbreak was "over." Since July 10, 128 cases of Legionnaires' have been reported. No new cases have been reported in nearly three weeks. "We have not seen anyone become sick in the area of the outbreak since Aug. 3 and we are now well past the incubation period of the disease," Bassett said. City, state and federal officials canvassed more than 700 sites in the south Bronx, where the outbreak was focused, in their search for the source. In total, 14 of 39 buildings with the type of cooling towers that lend themselves to Legionella growth were found to be contaminated. VideoVideo of Restaurant Server: 'If I Was Nice to You, I’d Get Canned"
The Opera House Hotel said in a statement that it was disappointed to learn its cooling tower was the source of the outbreak. "It's particularly disappointing because our system is 2 years old, has the most up-to-date technology available and our maintenance plan has been consistent with the regulations that both the city and the state are putting in place," the statement said. "We have worked closely with both the city and the state since this issue first arose and have done everything requested to address the situation." Photoshopped Princesses: Cute or Creepy? The Opera House Hotel said it fully supports the new regulations. "We believe they are appropriate and will enhance the protection of public health. That said, we intend to go beyond the requirement to test our cooling tower every 90 days by testing every 30 days when the tower is in operation," the statement said. "Given recent evens, we have decided to be especially cautious going forward."